A wide variety of laparoscopic grasping and dissecting forceps are available. Variables to consider in selecting from the available forceps include: re-usable (after sterilization in an autoclave between uses) versus disposable, length (often 36cm versus 43cm), handle style, fully rotating versus fixed angle tips, and the shape of the tip. The cost of instruments is important for virtually all operating rooms these days. When an OR decides whether to purchase re-usable or disposable instruments the issues include the sturdiness of the instrument (disposable units sometimes are a bit flimsy since they are intended for only one use), cleaning time (required of the OR personnel) for a re-usable instrument, costs associated with maintaining and running the autoclave (sterilization unit), cost of storage space for multiple disposable instruments, and environmental concerns (with discarding large volumes of disposable surgical instruments). The length of the instrument is important when the trocar is far away from the target organ that must be reached. With pelvic surgery, the shorter length is generally adequate. The handles vary considerably. Some handles lock the tips of the instrument in place with a ratchet. Many handles have finger holes and others may have straight handles that squeeze together using your entire hand. The ability to rotate the tips as needed is often useful. If available, rotating tips are potentially helpful and have no real downside (disadvantages). The shape of the tip that is used is very important to the surgeon. Some grasping and dissecting forceps are atraumatic (cause very little tissue damage when used properly). 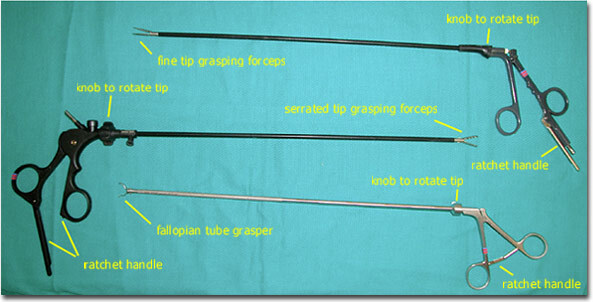 The size and consistency of the tissue to be grasped also determines the size, shape and qualities of the grasping forceps that should be considered. Forceps with jaws containing multiple teeth are used for accurate gripping. Forceps with (sharp) claws will hold tissue securely but puncture the tissue that is being held in place. Forceps with serrated tips often grasp and dissect well with little trauma. Specialized graspers are available, including for the fallopian tube or the bowel.